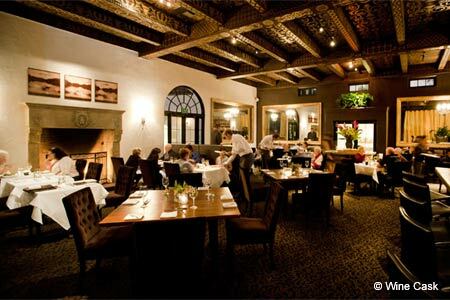 One of Santa Barbara County’s most comprehensive wine-and-dine experiences. About the restaurant: Ground zero for wine and cuisine in Santa Barbara County, Wine Cask comprises a trio of the restaurant, Intermezzo wine bar and Margerum Wine Companywine tasting room orbiting one of the city’s most historical courtyards. The interior is dark and moody, sleek and sophisticated, though not formal and stuffy. There are also private rooms available, including the Wine Library and Riviera Room. Likes: Sophisticated dining room, including a fireplace. Dislikes: Chefs seem to change as frequently as the seasonal menu, so we have not assigned a rating. Drinks & Food: Executive chef Brandon Cogan has taken charge of the kitchen and can devise a tasting menu of five ($75) or eight courses ($95). The à la carte menu changes seasonally, but you may encounter such dishes as octopus “a la plancha,” gnocchi Parisienne and roasted filet mignon with black truffle gratin, grilled asparagus and black truffle jus. Lavender crème brûlée remains a mainstay on the dessert menu, which also might offer bread pudding with bourbon-salted caramel and chocolate molten lava cake. The sommelier guides patrons through a phone book-size wine list that has a strong showing of Santa Barbara labels.